French Toast Pudding with Ginger Pecan Granola - A recipe from Savor California, the online showcase for extraordinary gourmet foods and beverages from California. Butter a small baking dish, roughly 9 x 6 x 2 1/2 inches. Cut the sliced bread into 4 triangles per slice. Overlap the triangles in the buttered dish, and cut some into smaller triangles to fit the holes. Beat the eggs until light and add the sugar, vanilla, nutmeg and salt. Then add the milk: the richer the milk, the richer the pudding! Cover with plastic wrap push the bread down gently, so that it soaks in the milk and egg mixture. Refrigerate overnight. Preheat the oven to 350 degrees with rack in the middle. 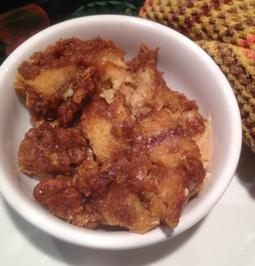 Mix softened butter, brown sugar, and cinnamon. Then mix in the granola, breaking up any big chunks. Spread the mix over the bread tops, reaching down into the valleys to get some topping clumps submerged. When finished, lightly drizzle the maple syrup over the top. Set pudding dish inside a larger baking dish and make a water bath, filling the outside dish with water halfway up the side of the inner dish. Bake for 35-40 minutes, until the pudding is getting firm and the topping is nicely browned. Eat it right away for a decadent breakfast! Or serve chilled for a dessert pudding.